A powerful, soaring novel about a stolen desk that contains the secrets, and becomes the obsession, of the lives it passes through. For twenty-five years, a solitary American novelist has been writing at the desk she inherited from a young poet who disappeared at the hands of Pinochet's secret police; one day a girl claiming to be his daughter arrives to take it away, sending her life reeling. Across the ocean in London, a man discovers a terrifying secret about his wife of almost fifty years. In Jerusalem, an antiques dealer is slowly reassembling his father's Budapest study, plundered by the Nazis in 1944. These worlds are anchored by a desk of enormous dimension and many drawers that exerts a power over those who possess it or give it away. In the minds of those it has belonged to, the desk comes to stand for all that has disappeared in the chaos of the world-children, parents, whole peoples and civilizations. 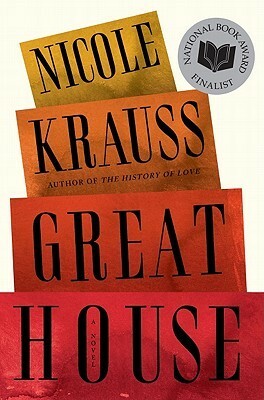 Nicole Krauss has written a hauntingly powerful novel about memory struggling to create a meaningful permanence in the face of inevitable loss. While the summary was intriguing, most Book Club members found the novel decidedly less so. The general consensus was that while the novel wasn't without merit--it had some poetic passages and psychological insights (there was a fairly intense discussion about what kind of spiritual pain the desk might represent)--it had, in the words of one member, "way too many words." The novel was so (unnecessarily) lengthy that most Book Club members found it difficult to get through; in fact, several didn't finish it. The novel's cast of joyless, alienated, generally unlikeable characters did nothing to make reading Great House any more enjoyable. If you're in the mood for some heavy but insightful reading, you might be interested in Great House. If not, though, you might enjoy the December selection, A Cup of Christmas Tea by Tom Hegg. This book is sweet, seasonal, and (best of all) short. Copies of A Cup of Christmas Tea are available at the library's front desk. The Book Club will be discussing it on Wednesday, Dec. 11, at 6:30 p.m. in the Augusta Library. The Book Club is free, and new members are always welcome. Please contact the library at (715) 286-2070 or aulib@augustalibrary.org if you would like more information.